Do you remember the old wooden radios in your grandparent’s house? They probably listened to music, news, the Friday Night Fights or maybe Fibber Magee and Molly among other popular radio shows. For most folks in the 30’s, 40’s and 50’s, radio was an important form of entertainment and information flow into the household. Well, we remember those beautiful old radios as family centers, gathering places and often, real furniture in the case of some of the beautiful and ornate consoles and chair sides. 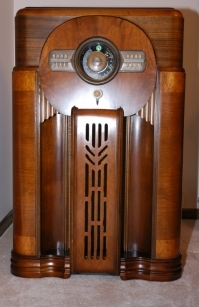 Several years ago we bought a restored 1939 Zenith 9S367 console from our good friends John and Jean Goller of John and Jean’s Radio Restorations. This console was the same one I remember in my grandfather’s house when I was growing up. That purchase was a catalyst and after that my wife Linda and I started restoring these beautiful old radios for ourselves and others with an interest in these wonderful, memory filled radios. We concentrate on wood table radios and wood consoles from the late 1920’s, 1930’s and early 1940’s but we also work on bakelite and plastic radios as well. Linda does full cabinet restorations and I do full electrical and mechanical restorations. Our restored radios are as close to “original” as we can make them remembering that most were manufactured 60 to 70 years ago! Please take a few minutes to look at some examples of our restored radios, some of which are available for sale, by selecting the appropriate tab above. You may also want to look through the listing, some with pictures, of our inventory of un-restored radios that are also available for sale. Just click on the appropriate tab above. Whether you are interested in one of our radios or have a family treasure or you are just interested in having one of these wonderful radios for your home or office, take a tour through the site and either drop us an email or give us a call, we love to restore old radios! We can provide estimates for restoration of your radio, radio cabinet or radio chassis. We'll need to see pictures or the actual radio before we can hope to create an accurate estimate however. All work is warranted for 90 days. Give us a call, drop us an email or shoot us a postcard! Your radio or one of ours ... either one works!